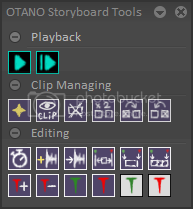 OTANO Storyboard Tools - Welcome to TVPaint Community forums ! So they idea behind this was simple : Managing editing in TVPaint can be quiet difficult sometimes because even if you use the timeline view to edit you storyboard you still have some problems syncing sound correctly. All the scripts in this panels will keep your sound in sync with your clips, you have some of those functions already in TVPaint but I replicated them with George scripts so they also offset sound if they change the timing of your cuts. For example : if you have a long dialogue in timeline view synced with multiple shots at the end of your storyboard, changing the timing of one of the shots (or creating/hiding/deleting clips) at the beginning of your project with those buttons keeps your dialogue in sync at the other end. That way you can have sound across multiple shots without having to embed them in the clip with the "split track to clips" option that is not really convenient when you're editing your animatic. I found that sound splitted in different clips that will each change in length can be hard to manage. A lot of those tools work with mark ins and mark outs so you can change your editing + sound without touching your layers. It will be difficult for your habits but if you want to keep your sound in sync using this panel you have to avoid using tvpaint's interface (like hiding clips, setting mark etc...). The "Clip Editing" button is your main tool and most advanced script for animatic so use it well! You can avoid using a lot of buttons with this one. - Play from current frame : If in project tab, play your storyboard from current clip and then goes back to current clip and image (tvpaint was going back to the first clip instead). Plays your clip as usual if in clip tab. - Clip New : Creates a new clip with same length than your current clip (when it timeline view it's hard to manage clips with a length of 1 frame). Layer is already stretched to the end of the clip so you can draw on it in timeline view without having to go to the first frame (I advise you to deactivate autobreak/create by default to avoid breaking your instances). Also have the same name plus "_b" to avoid having a space in the name (in french version the default clip name has a space). And offsets sound regarding the length of the new clip. - Clip Hide toggle : Toggles clip hide state and offsets sound (doesn't undo properly for now so be carfeful to use the script again instead). If you use shift when clicking it will also offset the sound right net to the clip, it's usefull if the sound of your clip shifted left when you hid your clip and you want to put it back in sync when you decide to unhide it. - Clip Delete : Deletes current clip and offsets sound. - Clip Duplicate : Duplicates current clip and offsets sound. If you use shift when clicking the sound doesn't offset so you keep it in your first clip. - Clip Next/Prev Skip Hidden : Just a shortcut so you can navigate between clips by skipping hidden clips (useful especially in clip tab when you're cleaning your storyboard). - Sound import : Opens a file requester to import a sound file and offsets the sound to your current image (TVP puts it at the beginning of the timeline which is a little annoying for long storyboards). Be aware that it doesn't work if you have unusual characters in your file's path/name. - Sound offset : Just offsets sounds after current frame by a chosen number of frames. - Layer Stretch to mark : Usefull script to stretch your layer to your mark in and mark out. I use it especially for camera work because the interpolation time follows the length of your layers and not your marks. Use it also when my layer's post behaviour in on hold and I'm out of the instance but need to draw on it at current frame. - Marks set to Clip Extremes : Sets your mark In/Out to the first/last image of your clip regarding all your layers. Usefull when changing timings in your clip and you want to keep your marks at the extremes and offset sound. - Marks set to Layer Extremes : Same than above but sets marks to your current layer extremes instead. - Markout Inc/Decrement : Just a way to precisely fine tune the length of your clip, it will move your markout one frame left or right. If you use alt and/or ctrl it will offset 5 frames, 10 frames will both shortcuts. If you use shift is will compensate the change in length in your next clip so you keep the global length of your clips. It also offsets sound, of course. - Markin/Out Clip/Project Set : Sets your mark to current frame (in/out and for clip or project regarding the button you use), and if there is already a mark at current frame it toggles the mark instead. The ones for clips are offseting sound, and the ones for project are nice if you are in Inlay View and you don't see the remote under your canvas to set your project marks (which is what I personally experience). - Please note that the scripts will not work properly if you have spaces in your clip names (doesn't happen unless you split clips/have another language (like french) in TVP). To fix that I advise you to use this nice script by Mads Juul to batch rename your layers. - Importing sound doesn't work with unusual characters for file paths and names (so beware of spicy spaces D:). I'm open to any suggestion, new tool idea or bug reporting, I can update the scripts quickly so don't hesitate to ask. - Maybe a script to have the frames of the clips following the global frames of the project by moving layers right and settings marks. - Adding timing tools working with markins and markouts, with the new script you'll be able to have your marks updating even if they are not at the extremes of your script. - A split clip button that renames splitted clips without space (and check if there is no other case when you end up with a clip name with unusual characters). And that works if your instance is in hold mode and doesn't stretch far enough. - Make Delete Clip work when there is only one clip in project. - Make Negative Markins work with a script to normalize the clip to frame 0 by moving everything to the right. - Undoing clip hide toggle doesn't unhide/hide clips. I wanted to test the panel... but I realise there is still a bug when using sound tracks in storyboard on Mac... -_-"